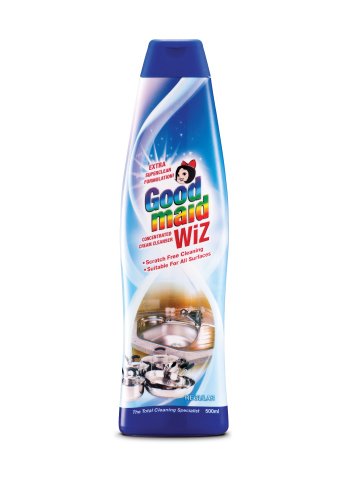 WIZ Cream Cleanser - Goodmaid Chemicals Corporation Sdn. Bhd. 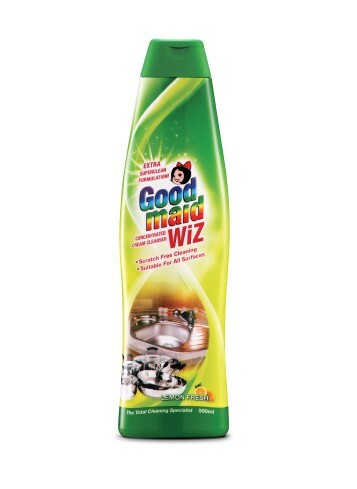 Liquid abrasive cleaner in cream form, it offers gentle yet powerful cleaning to keep all sorts of surfaces sparkling. • For use in the kitchen, bathroom and around the house. • Powerful and concentrated creamy formula cuts through even tough grease, burnt-on food, grime between tiles and soap scum, leaving the surface thoroughly clean. • Simply lift cap and squeeze directly onto surfaces. • Wipe clean with a damp cloth or sponge and rub to remove stubborn dirt and stains. SUPERCLEAN formulation with EXTRA SHINE properties is perfect for glass and other surfaces.